The Transportation Standing Committee passed a recommendation that Halifax Regional Council budget to paint zebra stripes on 500 crosswalks. The initial price tag for the stripes is $155,000, and $85,000 every year afterwards to repaint. The idea is to make drivers more aware of crosswalks and pedestrians. 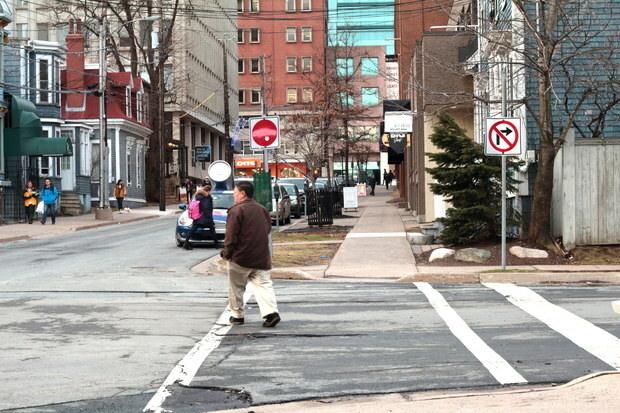 Drivers are hitting pedestrians all over HRM. Two separate accidents happened within 24 hours of the committee meeting. “Check your BlackBerrys, folks, there was another hit this afternoon,” said Coun. Tim Outhit (Bedford-Wentworth). “Folks, the status quo is not working,” said Coun. Barry Dalrymple (Waverley-Fall River-Musquodoboit). Coun. Russell Walker (Halifax-Bedford Basin-West), waving a blue report in the air, said he wanted more data on whether or not zebra stripe crosswalks are actually more visible to drivers. A Transportation Association of Canada survey of traffic zones around the country could find no data showing the benefits of striped crosswalks because there had been no studies. The association calls zebra stripes “desirable” but not essential. The municipality’s “Distractions Kill” advertisement campaign, designed to promote pedestrian safety, ran for two weeks in 2013, said Outhit, and cost $71,921. The zebra stripes are designed to last a year at more than twice that price. Council also requested a report on how much money the municipality should direct to the Share the Road campaign. The campaign is designed to raise awareness of everyone who uses roads through public workshops, community events and signs. Dalhousie prof Ashan Habib presented a study on Nov. 21, 2013, to the Active Transportation Advisory Committee detailing statistics of cyclists hit by cars in Nova Scotia. Council passed a motion, proposed by Coun. Jennifer Watts (Peninsula North), requesting a report on accessibility changes to the Nova Scotia building code. Changes would include mandatory lever door handles instead of round knobs — easier to grasp for those with limited hand dexterity — and wider doorways. Older buildings often have narrow doorways, too cramped for people who use wheelchairs to pass through. Vancouver’s city council voted to make similar changes to their building code last year. The changes affect new construction, renovations and additions. “I certainly think that we have to keep reminding the public that we’re not going out there and asking them to change their homes,” said Coun. Waye Mason (Peninsula South-Downtown).